Mrs. Belinda Aderonke Odeneye was born on the 3rd of September, 1965 in Manchester, United Kingdom into the family of Mr. and Mrs. S. A. Kadara of Oyingbo, Lagos State, both parents are of blessed memory. She attended k. Kotun Memorial Nursery and Primary school, Bode Thomas Street, Surulere, Lagos for her primary education (1970-1976). Her Secondary School education was at Government college, Agege, Lagos State in 1976-1981 where she completed her West African school Certificate with Grade(I). Her tertiary education was at University of Ilorin, Ilorin, kwara State where she studied Industrial Chemistry and graduated in 1985 with second class Honours bachelors Degree. She served the Nation at Federal University of Technology, Owerri (FUTO) Imo State as a Graduate Assistant at the school of Natural and Applied Sciences (SNAS) from 1985-1986. 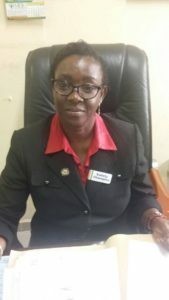 Her job experience started with two different industrial attachments at Imarsel Chemical Company and Pfizer Product Limited during her degree course in 1983 and 1984 respectively. She has attended several capacity building conferences to enhance her capabilities. Such include NERBOSH (National Examination Board on Occupational Safety and Health, Offshore Oil and Gas Environmental Practices in Netherlands. She Obtained her Masters Degree in Environmental Pollution Control from the University of Leeds in the United Kingdom in 1992. She got employed by the Federal Civil Service Commission as a scientific officer in the Federal Ministry of Works and Housing, Environmental Planning and Protection Division (EPPD) which became Federal Environmental Protection Agency (FEPA) then Federal Ministry of Environment. She transferred her service after 23 years of meritorious service from the Federal Civil Service to the Lagos State Civil Service Commission in January 2010 and was posted to the Lagos state Ministry of the Environment with further posting to Lagos State Environmental protection Agency(LASEPA) till February 2012 and then Lagos State Safety Commission till date. Routine inspections to upstream activities in the Niger Delta region. Environmental risk assessment of Oil and Gas facilities operations. Event response to various pollution hazards arising from petroleum products leakages spills and vandalization. Routine inspection to tank farms, depots and other mid-downstream activities. Safety Compliance Monitoring to work places. Budgeting and Submission writing for projects to undertake. Safety Sensitization awareness and enlightenment programmes. Safety measures standards and regulations development. School safety compliance manual development and review. Health safety and environmental inspection and audits. Night club and Bar Safety advocacy, inspections and Enforcement. Comprehensive monitoring of facilities in order to encourage self reporting and voluntary compliance. Extension of research for prevention of industrial pollution. Research on continuous improvement of safety. Specialist Member of International Institution of Risk and Safety Management (IIRSM), UK. Member, Health and Safety Practitioners Association, Nigeria. She attended World congress on Safety and Health in August 2014 at Frankfurt, Germany, Safety and Health Expo at Excel, London, United Kingdom in June 2016. Mrs. Belinda Aderonke Odeneye is happily married to Mr. Seth Adetunji Odeneye and they are blessed with children.